HTC One Max (Initial Review) was earlier reported to arrive in India Next week for Rs. 56,000. This phone is already available for purchase from The Mobile Store at Rs. 53,909. The availability info doesn’t come as a surprise. The HTC One Max will be a treat for those who love that extra screen real estate, but the price tag does seem inflated. HTC might also launch a couple of more Desire series smartphones in India by the end of this year. “We will be launching HTC One Max priced at Rs 56,000 and two accessories – HTC Mini+ and HTC Fetch – in the Indian market next week,” HTC Country Head Faishal Siddiqui told Business Standards. HTC Mini+ can work as phone, camera remote and even TV remote when connected to selected HTC android phones. Another Handy accessory, HTC Fetch is a keychain which can trigger the ringtone from within 15 m range, to help you locate it. The 5.9 mm display of this phablet features Full HD 1080p resolution (373 ppi). The SLCD3 Display will be bright and responsive. The Software used is HTC Sense 5.5 UI on Android 4.3 Jelly bean. This phone is powered by 1.7 GHz quad core Snapdragon 600 chipset with 2 GB RAM and 16 GB of onboard storage. Thanks to the removable back cover, you can extend the storage to 64GB using MicroSD card. The battery capacity is 3300 mAh and Connectivity features include 3G HSPA+ up to 42 Mbps, WiFi , Bluetooth 4.0 with aptX codec, NFC, DNLA, MHL and GPS with GLONASS. The Ultrapixel camera (4 MP) we saw in HTC One has also made its way to One Max. The large pixels help in absorbing more light and thus delivering better low light performance. 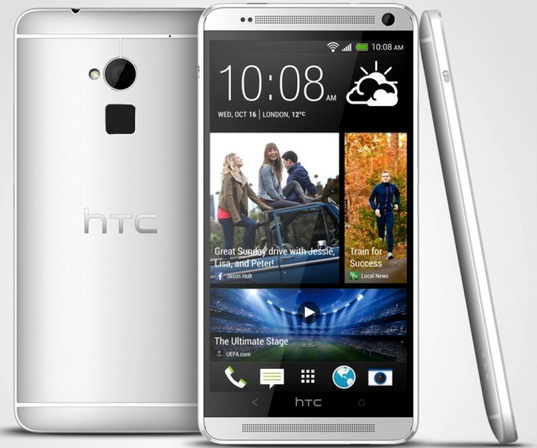 For detailed hardware specs you can read our HTC One Max Quick Review. For a lesser price tag, you can get fabulous Android Tablets like Samsung Galaxy Note 3 and if enjoying Multimedia content on your smartphone is your priority, you can also wait for Nokia Lumia 1520, which is expected to be priced around 45K INR.